Prior to this, Amazon applied the discount to games released in the past two weeks. FWIW, amazon.ca did this before later dropping the discount from 20% to 10%, so the same might shake out on this side of the border too. 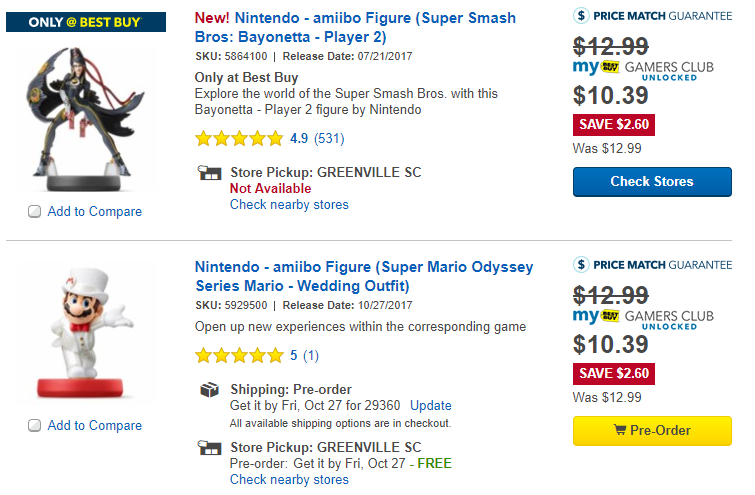 One more reason that Best Buy's GCU makes far more sense for anyone who buys more than one full-priced game a year. GCU also still works on stuff like Amiibos as well, right? Bummer, although I can't think of an instance where I decided to buy a game after it's release date. I think my game buying habits are different from most though. Also, Amazon Canada will only get a 10% discount, instead of 20. I can't remember if it was here or CAG, but there were rumors of Target doing something for Red Card members too. Can't remember if 10% or 20% was being thrown around, but on top of the 5% we already get, anything additional would be great. Especially on top of deals like they had last week with 30% off games. I kinda game up on Amazon for deals anyways. With their already limited two week window and since they cut out premium versions of the games, it wasn't worth it when Best Buy is already doing 20% and brought back the $10 reward zone certificates for bigger pre order releases. I guess Best Buy keeps my business. That's crap because often on some of the smaller games (which is what I tend to preorder)...Amazon won't put a 20% discount until one or two weeks before release. So you have to wait and then remember to maybe get in. (See World to the West). Amazon says they want your money but then they pull things like this.